The staircase has evolved into more than just a means from passing between floors. In most homes, the staircase has become a fundamental element of the architectural design. A well-designed staircase makes a powerful statement aesthetically while still functionally performing. Situated in the center of the home with custom fabricated railings from Southern Staircase, it’s a focal point in the home’s design. The iron railings and banisters were designed to provide openness, complimenting the home’s floor plan and creating a dramatic impression from the front entry. The railings were designed to mount into the wall rather than the floor to expand the width of the stairs, emanating a feeling of grandness that compliments the home. The Gothic curves of the railings enhance the architectural style of the home. 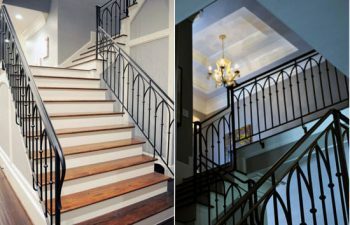 Southern Staircase worked closely with a local HGTV celebrity to create a specific and special design, executing the design teams vision and provided quality installations and effortless communication throughout the project. For more information on this quality project, visit our Insidesign article. Despite the number of technical challenges, Southern Staircase was able to deliver. The client couldn’t be happier!